late Ottoman history, international law, and freedom of speech. "The Armenian Cause: Past, Present and Future"
The Ottoman-Armenian tragedy of 1880-1919 is a dark chapter in Turkish - Armenian history. A relationship that started in the 1071 Battle of Malazgirt as a partnership against Byzantine oppression suffered greatly in the late 19th and early 20th centuries as over one million Turks and Armenians died warring for eastern Anatolia. What is needed is a mutual narrative of the shared history of Armenians and Turks to bring reconciliation and healing between the two peoples. Günay Evinch was a United States Fulbright Scholar and Japan Sasakawa Fellow on the Armenian matter in eastern Turkey, 1991-93. Evinch is a recent inductee to Washington's prestigious Cosmos Club for Distinction in Foreign Affairs. He also serves on the Heritage Council of the United States Office of the Director of National Intelligence (ODNI). Evinch worked in the Turkish Armenian Reconciliation Commission (TARC) with the late Turkish Ambassador Gunduz Aktan. Evinch also served on the World Affairs Councils of America (WACA) National Board with U.S. 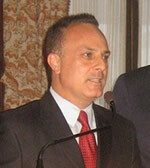 Ambassador Marc Grossman. Evinch received his Juris Doctor from Washington & Lee University School of Law, Virginia (1991), completed an EU Legal Studies Program at the University of Madrid (1989), and double majored in Economics and Public Service at the University of California, Davis (1986). Evinch received the Lee Law Grant as well as the UC Regents Outstanding Senior Award. Evinch interned with the San Francisco District Attorney, Sacramento Federal Public Defender, and San Mateo office of the late Congressman Tom Lantos. Evinch currently serves on the Assembly of Turkish American Associations Board of Trustees and was ATAA's first American born and 14th President (2009-11). ATAA, representing over 60 local chapters and 500,000 Turkish Americans throughout the United States, serves locally and in Washington DC to empower the Turkish American community through civic engagement, and to support strong US-Turkish relations through education and advocacy. Established in 1979, ATAA is the largest, democratically elected Turkish American membership organization in the United States. As a non-faith based organization, ATAA is open to people of diverse backgrounds. The ATAA is a 501(c)(3) non-profit organization formed under the laws of the District of Columbia. To learn more about ATAA, please visit www.ataa.org.